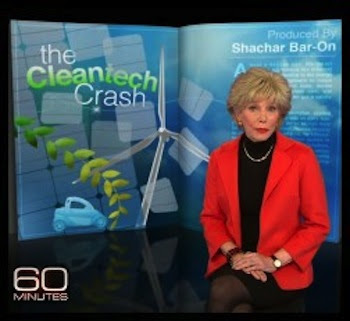 A recent 60 Minutes segment reports a “Cleantech Crash”—even though the industry’s booming. Call on 60 Minutes to appoint a Public Editor to investigate this broadcast immediately. Those who watched 60 Minutes this past Sunday might be under the impression that cleantech is dead, our hope for a much-needed green energy economy down the tubes. Fortunately for the world and unfortunately for good investigative journalism, 60 Minutes got the future of clean energy technology wrong—very wrong. Their segment, entitled “Cleantech Crash” and hosted by veteran 60 Minutesjournalist Lesley Stahl, focused almost exclusively on failed cleantech startups and implied the Department of Energy’s loan guarantee program is a flop—despite the program’s 97% success rate. Worse yet, the segment entirely ignored the driving force behind much of the cleantech economy: fighting climate change. Now media watchdogs are already calling for the appointment of a Public Editor to investigate this report, among other ethical complaints (like the shoddy 60 Minutes coverage of NSA surveillance and the attacks on the U.S. compound in Benghazi). Together, thousands of us can build enough pressure to turn this idea into a reality. Tell 60 Minutes: appoint a Public Editor to investigate “Cleantech Crash” immediately and ensure accurate investigative journalism. “Cleanteach Crash” wasn’t only misleading in its focus on cleantech’s failures—it also neglected to mention its massive successes: sustained investments, booming solar business, and declining greenhouse gas emissions in the U.S.
Whatever the reason for this fluff journalism—possibly the influence of CBS News’ president, David Rhodes, also the former VP at the denial-happy Fox News—60 Minutes can still redeem itself by appointing a Public Editor. The role of a Public Editor is to safeguard the integrity of investigative broadcasting by promoting dialogue with viewers, advocating for stories that serve the public interest, and scrutinizing slanted reporting—just like the “Cleantech Crash” segment. “Cleantech Crash” misled viewers and posed a real threat to clean energy. Sign the petition to demand that 60 Minuteshire a Public Editor to keep their broadcasting clean. Forecast the Facts is a grassroots organization that empowers people to fight climate change denial and promote accurate information about the climate crisis. You can follow us on Twitter, and like us on Facebook. Help us end climate denial once and for all by contributing here.